As the first pan-Arab space programme was announced earlier this week, it was named in honour of the Islamic Golden Age. But when Satellite 813 launches in 2022, it will tackle far more modern problems, including desertification, drought and greenhouse gas emissions. Back on earth, the collaboration of 11 Arab states, including the UAE and Saudi Arabia, aims to drive forward a renaissance of Arabic enquiry and research. The satellite will be entirely funded by the UAE and will help alleviate the financial barriers faced by mid-sized countries wanting to enter the space sector. 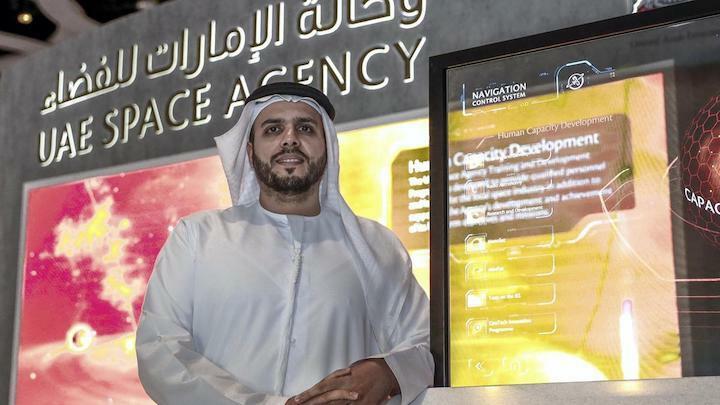 “If you’re a new player to space you need support, you need to work together, you need to cooperate,” said Mohammed Al Junaibi, the executive director of space sector at the UAE Space Agency. Scientists aim to launch Satellite 813 into a low altitude orbit of around 600km above the earth. Researches expect it to have a lifespan of some five years, allowing a vast treasure trove of information to be gathered and reviewed. Over the next six months, the UAE Space Agency will work closely with the Ministry of Climate Change and other government departments to establish the specifics of the mission. What is known already, however, is that the probe will be manufactured at the National Space Science and Technology Centre at the United Arab Emirates University in Al Ain. The oasis city, some 90 minutes south of the capital Abu Dhabi, is set to become the region’s hub for space research. “Of course the most significant challenge facing any country that wants to embark on space exploration is the budgeting,” said Dr Mohammed Al Ramadhan, the director of the Research Directorate at Kuwait Foundation for the Advancement of Sciences. The UAE Space Agency also plans to operate tourist space flights from Al Ain International Airport with Virgin Galactic. But while commercial space travel has undoubtedly helped drive both funding and advances in technology, Charles Bolden, a former astronaut and Nasa administrator from 2009 to 2017, said government space programmes still had a critical role to play. “There are going to be bad days,” he told an audience at the Global Space Congress, a gathering of industry leaders in Abu Dhabi this week. “And I mean bad days when you lose a crew. “But you’ve got to be able to get up after that and you need an anchor tenant that’s going to be there with you through bad times. That’s the role that governments should play. Sheikh Mohammed bin Rashid, Vice President and Ruler of Dubai said Satellite 813 had been named after the House of Wisdom, a centre of learning in Baghdad during the Islamic Golden Age. But the number 813 is also a reference to one ruler in particular who understood the importance of the role government could play in scientific research. Caliph Al Mamun assumed power in 813 and the House of Wisdom reached its pinnacle under his reign. He is often considered the first ruler to patron large-scale scientific study, including projects like the construction of Baghdad’s first astronomical observatories. Under his reign, scholars were well paid and their work prized by society. The hope is that Satellite 813 will inspire a new generation to relish learning as they did in the time of Al Mamun.